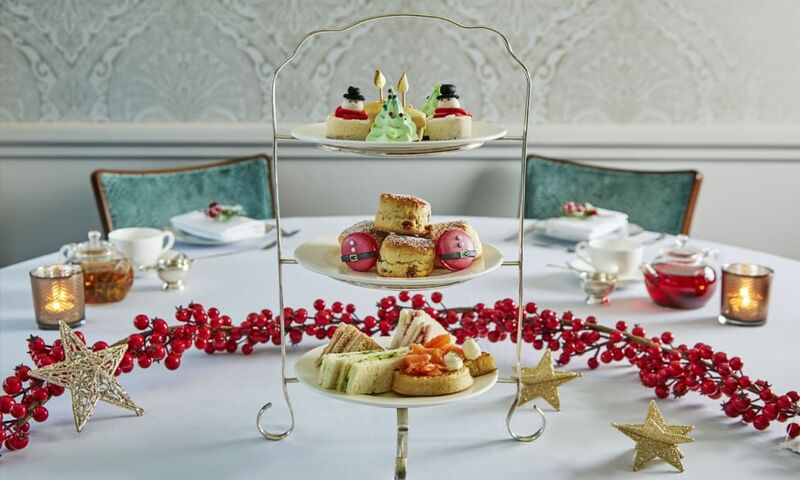 Utterly indulgent and extraordinarily enjoyable, afternoon tea in the capital can be almost anything you want it to be…from moorish to on the move, and from festive to fantastical. The Arch pays patriotic tribute to Her Majesty with its Royal Afternoon Tea. It’s up to you where you take it; the boutique hotel spans seven Georgian townhouses and two mews houses featuring a dazzling Martini Library, the romantic Hunter 486 restaurant, and a stylish Salon de Champagne lounge. As you’d expect from an archetypally British banquet, rare roast beef features, plus stilton cheese straws and chicken liver parfait with spiced fig chutney. There’s a colourful selection of confectionery, including Battenberg, strawberry and pistachio tart, and Eton mess. For admirers of Moroccan design and cuisine, Momo is a souk-inspired sanctuary where the mint tea flows and the Maghrebine flavours are as intense as you’ll find in Marrakech. It’s an Aladdin’s Cave of eclectic lanterns, colourful cushioned seats, mosaic-topped tables and latticed wooden screens. A quadruple-tiered stand holds savoury morsels such as zaalouk (aubergine salad) on toast and cheese briouats (puff pastries), as well as sweet scones with clotted cream, strawberry and fig jam, and pistachio macaroons. £22 per person; £32 with a glass of champagne. 25 Heddon Street, W1B 4BH. Anyone with an inquisitive mind, and a desire to be enchanted, will eagerly ‘tumble down the rabbit hole’ for The Mad Hatter’s Afternoon Tea. Set amidst flowering trees and trickling fountains in The Courtyard Garden of The Sanderson Hotel, this curious experience, where menus are hidden inside vintage books and plates are decorated with birdcages and carousels, is a feast of fantasy. The savoury side includes cucumber sandwiches on fresh lime bread, Cornish crab éclairs, and Wiltshire ham and smoked Applewood croque monsieur. Sweet seduction comes in the form of ‘blue caterpillars’, ‘magic marshmallow mushrooms’, ‘pocket-watch macaroons’ and ‘Alice’s drink-me potion’. £48 per person; £58 with a glass of champagne; £35 per child aged 4-11 years old. 50 Berners Street, W1T 3NG. 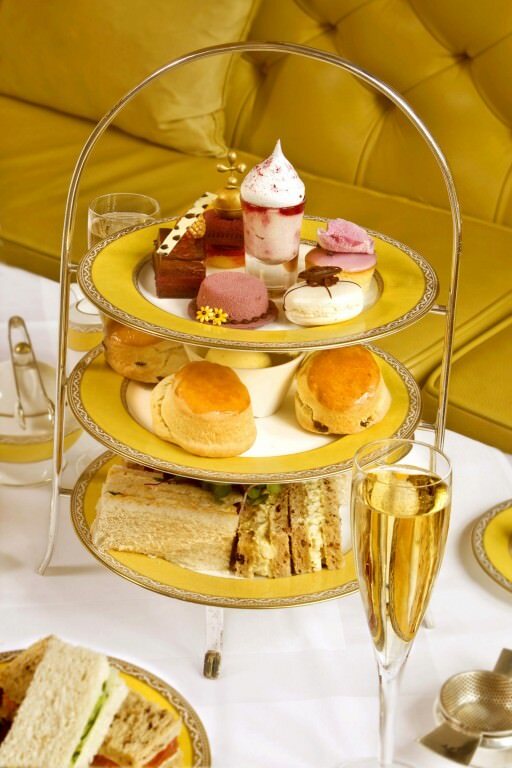 Take a pause from Christmas present-buying; hop around the corner from Harrods to The Capital where Claire Clark, widely recognised as one of the finest pastry chefs in the world, has designed aspects of this year’s Festive Afternoon Tea for the hotel’s Michelin-starred restaurant, Outlaw’s. A bright red Father Christmas-inspired macaroon is made from panettone and marmalade, and a lemon cheesecake is shaped as a snowman. In addition, enjoy savoury bites, warm scones with clotted cream and homemade jams and, if you’re feeling frazzled, a signature tea-infused cocktail. Available 21st November until 31st December. £29.50 per person; £39.50 with a glass of champagne. 22-24 Basil Street, SW3 1AT. Try Parisian-style patisserie aboard a double-decker, smartly revamped Routemaster, sipping tea and enjoying dainty bites as you sweep past Buckingham Palace and Big Ben, through Notting Hill and around Trafalgar Square. Brigit’s Bakery of Covent Garden brings you the B Afternoon Tea Bus Tour serving ‘L’Afternoon Tea’, a 90-minute moving feast of mini quiches, sandwiches, scones, tarts, pastries, macaroons and cakes. Best seats on the bus are for two, forward-facing on the front row of the top deck, but parties of four can opt for seats opposite each other. £45 per person; £35 per child aged 6 – 11 years old. 8 Northumberland Avenue, WC2N 5BY or Victoria Coach Station, SW1W 9TP. Talk about taking high tea literally. At 420 feet, on the 35th floor of the Shard, Ting has razzle-dazzle views right across London in every direction. The Far-Eastern-inspired décor provides a dramatic backdrop for Japanese Afternoon Tea with cucumber and sesame uramaki, salmon hosomaki and fried vegetable gyoza. Rest assured, you’ll not forgo cakes, choux, macaroons and meringues; they’re all there, but enlivened by ingredients such as matcha (ground green tea), pink ginger, black sesame and kumquats. £54 per person; £62 with a glass of champagne. 31 St Thomas St, SE1 3QU. The Goring is impeccably English and well known as the hotel that HRH the Duchess of Cambridge chose for her pre-wedding night. The hotel’s Bollinger Afternoon Tea has been honoured in the 2016 Afternoon Tea Awards and is served in a beautifully gilded room beside a roaring fire and overlooking The Goring’s garden. A selection of delicious seasonal sandwiches, scones and exquisite cakes are presented on a triple-tiered silver stand alongside, of course, a glass of chilled Champagne. £42.50 per person; £52.50 with a glass of champagne. 15 Beeston Place, SW1W 0JW. Having traded in teas since 1707, there’s no doubt that Fortnum & Mason knows its full-bodied Breakfast Blends from its smoky Lapsang Souchongs. Taken in the Diamond Jubilee Tea Salon – an exquisite room decorated in F&M’s signature eau de Nil and white – it’s an opportunity to step into a leafy, exotic domain. 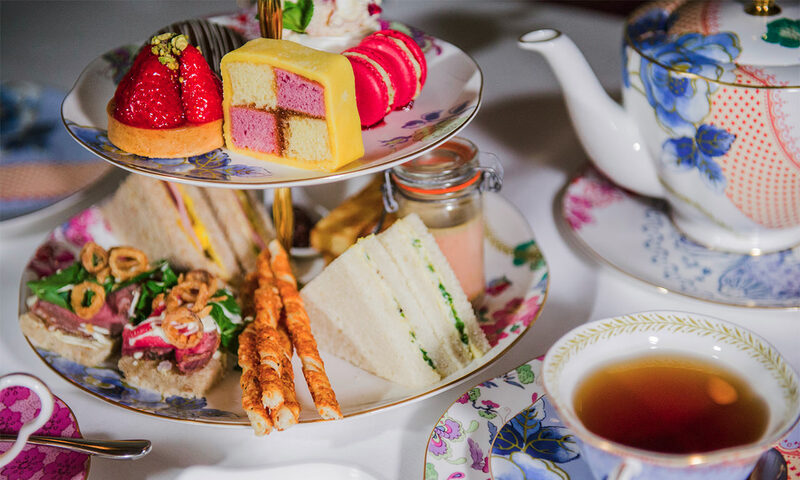 For the saccharine-opposed, the Savoury Afternoon Tea has all of the delicate sandwiches you’d imagine, savoury choux with smoked salmon tartare, plus Portland crab and cheddar cheese scones. £46 per person; £58 with a glass of champagne. 181 Piccadilly, W1A 1ER. For those who find too much frippery in finger sandwiches, Sanctum Soho Hotel offers a Gent’s Afternoon Tea with Scotch eggs, oysters, baby back ribs and mini steak rolls. Scones are served, but beefed up with raisins, and accompanied by clotted cream and homemade jam. Washed down with a tankard of Gentleman Jack, a twice charcoal-mellowed, 80 proof whisky, and followed by a cigar to smoke on the roof, this tea really sorts the men from the boys. £50 per person. 20 Warwick Street, W1B 5NF. Bobbi Brown, celebrating the 25th anniversary of her globally known makeup brand, has teamed up with her favourite brasserie, Balthazar, to create a limited edition afternoon tea. Cake, cosmetics and Covent Garden…does a more alluring combination for a girly get-together exist? Bobbi has collaborated with Balthazar’s head pastry chef, Regis Beauregard, to create beauty product-inspired bonnes bouches such as a champagne-infused rhubarb and ginger ‘shimmer brick’ and a pecan and jasmine ‘long-wear cream shadow’ macaroon. Guests are invited to a complimentary makeup lesson at the Bobbi Brown Studio just up the road. £27.50 per person; £37.50 with a glass of champagne or a ‘Bobbi’s Sparkle’ cocktail (Sipsmith Gin, elderflower, lemon and champagne). 4-6 Russell Street, WC2B 5HZ.